The variety of really good maps is not very wide. We can recommend maps of Editions Olizane in Switzerland, there are a few maps to chose from: the three-part Ladakh North, Center & South as well as a compiled map. 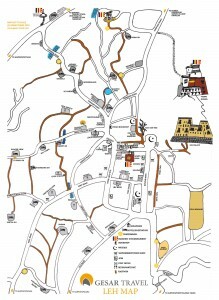 And since there are no (or no good) maps at all from Leh town, we made one ourselves, which you can download and print or simply get one in our Leh office or order it through Email. In any case, you can travel to Ladakh in cyberspace, via Google Earth. 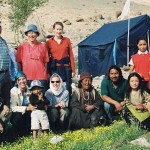 Unfortunately we are not providing a big variety of english books on Ladakh yet. We will work on the list. Illustrated book of Kamerakidz, a project in India, which Indian children allows to take pictures of their environment and then spread. The children receive a percentage of the profits directly, the rest flows back into the project. 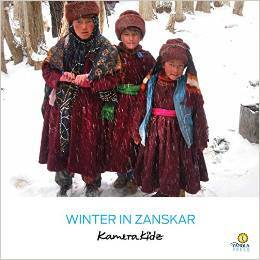 This book describes with words and pictures the life during winter in Zanskar, a remote region in the Indian Himalayas. A special book that grants an unprecedented insight. The book can be ordered directly from the publisher Yangla-Press.